Little notes from Heather and Martin: What can we do about microplastic in the ocean? Plastic waste: larger items that are broken down to micro scale by the action of the waves, UV light etc. after they enter the ocean. It is estimated that only between 5 and 31% of the microplastic in the ocean is 'primary' microplastic: the bulk of the microplastic in the ocean started it's oceanic life as bigger things. So, what can we do to stop plastic waste entering the ocean? Obviously, one way to reduce the rate at which large plastic items are deposited in the ocean is to stop manufacturing/buying them in the first place. However, that's only likely ever to be a small part of the answer. Firstly, plastics are ubiquitous because they're so useful! replacing plastic with other things could raise environmental costs at least fourfold, according to Trucost’s analysts. This is even true of the various virtue-signalling alternatives to plastic bags. A British government analysis from 2011 calculated that a cotton tote bag must be used 131 times before greenhouse-gas emissions from making and transporting it improve on disposable plastic bags. The figure rises to 173 times if 40% of the plastic bags are reused as bin liners, reflecting the proportion in Britain that are so repurposed. The carbon footprint of a paper bag that is not recycled is four times that of a plastic bag. By keeping food fresh for longer, plastic packaging substantially reduces organic waste, itself a growing environmental concern. So, whilst we can definitely 'refuse' some plastic items, the main answer is likely to be good municipal waste collection. This is confirmed in the map below. I found this really interesting. 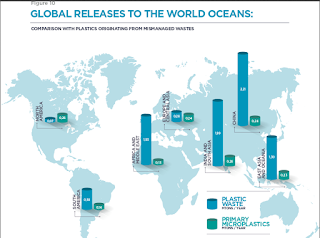 In the regions of the world where there are good municipal solid waste (MSW) collection systems (Europe and North America, and surely also New Zealand and Australia), very little plastic waste is released to the ocean. Indeed, so little plastic waste is released in our part of the world that here, primary microplastics 'compete' with plastic waste as a source of microplastics, even though they are dwarfed by plastic waste in the world as a whole. In places with poor MSW collection, in contrast, vast quantities of plastic pour into the oceans. Indeed just ten rivers - two in Africa, 8 in Asia - are responsible for fully 90% of all the plastic that arrives in the oceans globally (I learned this here, but the original source is here). Surely the most effective way to reduce the amount of plastic waste entering the ocean is to improve rubbish collection in the Majority World! Are there organisations I can support that do just that? Maybe! There are a number of NGOs working in this space, but the majority are the kind of NGOs that get their funding from institutional donors (e.g. the World Bank, USAID etc.) rather than private individuals. It is clearly an issue that the World Bank is focusing on, and Tearfund UK is encouraging their government to do the same when it comes to aid distribution. I intend to write to Winston Peters (Minister of Foreign Affairs and hence in charge of NZAID) to encourage him to consider making MSW collection a priority for our aid contributions. Maybe you could write to him, too? I'll try and write to TEAR Fund NZ as well, to encourage them to lobby for the same. If you're involved with a development charity, you could try and enlist their support, too! "Since 2010, New Zealand has helped Kiribati to implement a Solid Waste Management Initiative, which provided it with a regular solid waste collection system for the first time. The Initiative also delivers public education to reduce levels of waste, and improved landfill infrastructure and recycling systems. To date, New Zealand has provided $4.9 million to support this initiative. Additionally, between 2016 and 2019, New Zealand will provide $6 million to the Pacific Regional Infrastructure Facility, which is studying the feasibility of establishing a regional recycling network that would cover 15 types of waste, including plastic. New Zealand also provides $1.5 million annually to the Secretariat of the Pacific Regional Envrionment Programme (SPREP) to support their recycling work in the region." In terms of things I could support with my own money, I've come across just two possibilities. Firstly, Hand-in-hand, a charity based in Tamil Nadu in South India; and secondly Swiss Contact, a Swiss charity working in many countries in the Majority World. These are both large charities carrying out a wide range of projects, but both have municipal waste-related projects to which you can donate. In assessing them, you might like to see how they align with what has been found to be helpful in terms of which NGO involvement in municipal solid waste collection. So, that's 'plastic waste', but what about 'primary microplastic'? 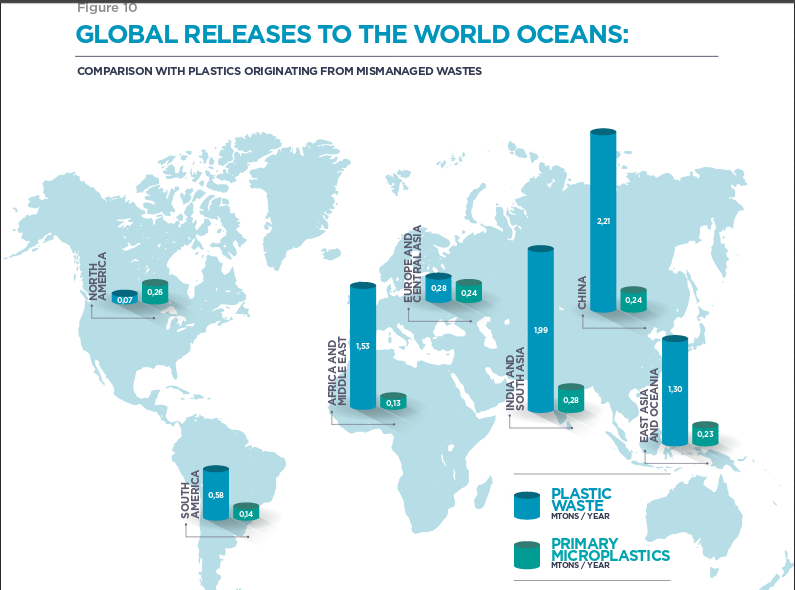 As I said, in places like New Zealand, around half the plastic entering the ocean is likely to be primary microplastic. What does that consist of? 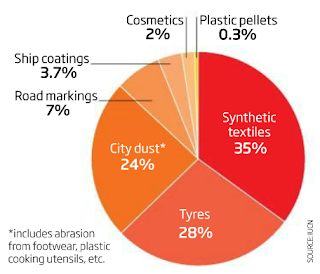 The biggest constituents are petroleum-based synthetic textiles (clothes etc. made of things like polyester getting eroded during washing) and tyres (bits of tyres wearing off as vehicles are driven around). Microbeads in cosmetics (the one everyone talks about), account for only 2%. Even here, there is a difference by region, with tyres being a more significant component in the West and synthetic texiles being more significant in the Majority Word (source). Unlike plastic waste, primary microplastics are extremely hard to capture. The most realistic way to prevent them entering the ocean is to prevent them forming in the first place. In terms of tyres (probably the primary source in New Zealand), something everyone can work on is driving less, as well as making sure their tyres are fully inflated and their wheels properly balanced whenever they do drive. In addition, tyre wear can be reduced by road pavement design. That's something Phil Twyford, the Minister for Transport could be lobbied about, as well as your local council (who are responsible for local roads). It is also possible to treat stormwater to remove some of the microplastic it contains before it is released to the ocean. In New Zealand, storm water is generally released straight to the ocean without any treatment: you could lobby your local council to look into changing that. There are also factors to do with the design of cars that can help but, as no cars are even assembled here any more, those are issues Kiwis have less control of. In terms of petroleum-based synthetic textiles (still likely to be a significant source of primary microplastics from New Zealand), the best thing we can do is not buy them. I have revised my clothes-buying hierarchy to reflect this. Check the labels and avoid polyester, polypropylene, poly cotton blends etc. (viscose, rayon, lyocell etc. are fine - they are cellulose based). If you're not sure if a synthetic fibre is petroleum or cellulose-based, Google is your friend! Note that, even second-hand petroleum-based synthetics are a problem: textiles do tend to shed slightly more fibres when brand new, but they continue to shed more every wash throughout the life-time of the garment. Given that around 75% of the clothes for sale in somewhere like Savemart are never actually bought by anyone, it's best that I leave the synthetics on the rack and thus increase their likelihood of ending up in the landfill! Any petroleum-based synthetics you already have should be washed as infrequently as possible - something I also intend to work on. I have also gone through my fabric box and split it up into petroleum-based and plant-and-animal-based fibres (by burning a sliver of each fabric - it was fun, and some of the results were surprising). Petroleum-based synthetic fabrics will be fine to continue to use for things I expect will be washed very rarely if at all (e.g. cushion covers or doorstops), but I want to stay away from them for clothing items in the future. Only about half the plastic entering the ocean in places like New Zealand is primary microplastic - the remainder is large items that have been missed by rubbish collection. I don't know what this mostly consists of, but I suspect the bulk of it is things that readily blow away. This waste stream may be able to be reduced by banning plastic bags, and efforts such as beach clean ups will also presumably help. Making sure rubbish bins are widely available (and frequently emptied) in public spaces would, presumably, also make a big difference. If you see places in your local community (especially near water ways) that lack bins or where the bins are always overflowing, you should definitely lobby your local council to remedy that! Reducing use of single-use plastic bags and plastic microbeads in cosmetics will have a negligible effect on the amount of microplastic in the ocean.